We need your help to keep our waterways clean. 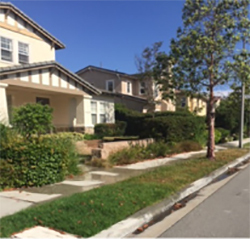 If you see anything other than water from a rain event in the curb, gutter, alley, or street, please report pollution below. Your contact information is confidential and will only be used contact you regarding details of this complaint. Soil, dirt, and gravel are among the many common stormwater pollutants that can degrade water quality. 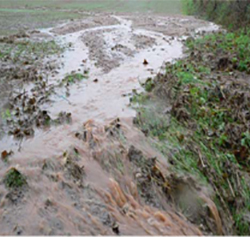 Stormwater runoff from property often contains large amounts of soil and dirt. This material may cause blockages of pipe and can cause flooding. Soil and dirt can also harm aquatic life by clogging the gills of fish, blocking light transmission, lowering water temperatures, and inhibiting photosynthesis. 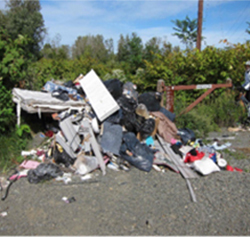 Litter and trash are among the many common stormwater pollutants that degrade water quality. Besides being unsightly, litter and trash can cause stormwater blockages of pipe and cause flooding. Trash also can harm aquatic life such as fish and frogs. 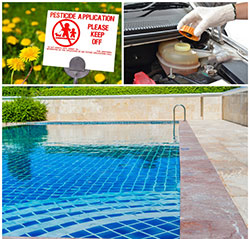 Examples include: improper storage of material, improper vehicle washing, improper pool/spa discharge, pesticides and other pollution causing activities. This pollution reporting tool is designed to pin point by address, the area that needs attention. Please type the address or closest address into the text box to make sure the correct agency receives your report. If you don’t know the address please drop the map marker as close to the location as possible.